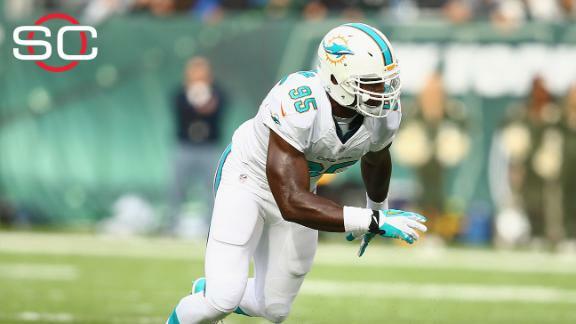 Miami Dolphins defensive end Dion Jordan, the third overall pick in the 2013 draft, has been suspended without pay for the entire 2015 season following another violation of the NFL's substance abuse policy. Although Jordan did not fail a drug test, per sources, the league determined that one of his test samples was diluted, which in this case counts as a violation. Jordan will not appeal and will accept his one-year punishment, his third suspension within the past year. "We were disappointed to learn about Dion Jordan's most recent suspension for violating the NFL's Policy and Program for Substances of Abuse," the Dolphins said in a statement. "A player's health and well-being are of the utmost importance to us. We have made every effort to support Dion, both on and off the field and we will continue to do so to the extent allowable under NFL guidelines." The suspension costs Jordan $3,335,418 in signing-bonus forfeiture and $2,275,209 in salary for 2015. Jordan's agent, Doug Hendrickson, refused comment on the suspension when contacted Tuesday by ESPN. Jordan's suspension comes as NFL teams are grappling over where to select two pass-rushers,Nebraska's Randy Gregory and Missouri's Shane Ray, each of whom has encountered marijuana issues in theweeks leading up to the NFL draft, which starts Thursday. Gregory, once considered a top-10 pick, flunked a drug test at the NFL scouting combine and now is viewed as a potential second-round pick. Ray was cited this week for marijuana possession, leading one general manager to text "2nd round" to ESPN as to the area he now believes the Missouri standout will be selected. Jordan's latest suspension will remind teams of the dangers they confront when drafting a player with off-the-field substance abuse issues. Jordan was suspended four games in July 2014 for violating the NFL's policy on performance-enhancing drugs. Shortly after he returned to work, he was hit with another four-game suspension for violating the league's substance abuse policy. At the time, Jordan said he was "undergoing treatment to address my situation" and thanked coach Joe Philbin and the entire Dolphins organization "for their support." In February, the Dolphins and Eagles were close to completing a trade for Jordan that could have happened were it not for the diluted test sample and the latest yearlong suspension. Since the Dolphins traded up to draft him with the third overall pick, Jordan has three career sacks in two NFL seasons. Adam Schefter reports that Dolphins DE Dion Jordan has been suspended for the 2015 season for another violation of the league's substance abuse policy.